Honeysuckle is a non-native, invasive plant species that negatively impacts native Missouri flora. Every fall a group of volunteers with the Kennedy Woods Advisory Group (KWAG) and Forest Park Forever spends a day cutting the vegetation and painting the stems with a Roundup® solution to kill the roots. The Problem: The invasion of bush honeysuckles over the past 20 years is the main reason that there have been few new trees sprouting and growing in the Kennedy Woods. The honeysuckle starts turning green much earlier (late February!) than the native plants. By summer, when acorns and other native tree seeds sprout, the honeysuckle has largely shaded the forest understory, causing the seedlings to die. The honeysuckle is spread largely by birds, which eat the red berries (we'd prefer to restock noninvasive native shrubs for the birds). It is particularly important to remove the berry-producing plants. The past six years we've been highly successful at ridding certain areas of the woods of honeysuckle. How We Do It: Late fall is the best time kill the honeysuckle. 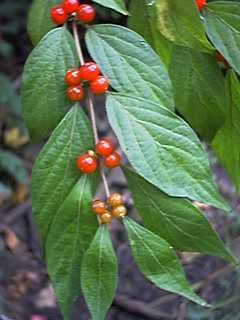 It's easy to recognize at that time because it's one of the few remaining plants with green leaves. We cut it near the ground with saws or loppers and paint a solution of high-strength Roundup® on the exposed stump. In fall, the Roundup® is pulled into the root system as the plant withdraws sap in preparation for winter. We need volunteers to work in 2- and 3-person teams to cut and paint. Typically we get roughly 100 volunteers each year. We'll supply the Roundup® , but volunteers are urged to bring their own gloves and saws, loppers, or pruning shears. It's hard work, but satisfying. * KWAG: We are mainly a group of birders who have been working for several years with the St. Louis Parks Department, St. Louis Police Department, Missouri Conservation Department, Forest Park Forever, and local environmental groups to preserve and rejuvenate the J. F. Kennedy Forest in Forest Park. It is our goal that the woods continue to be attractive to wildlife, and to people who want to enjoy wildlife or just take a walk in the woods.